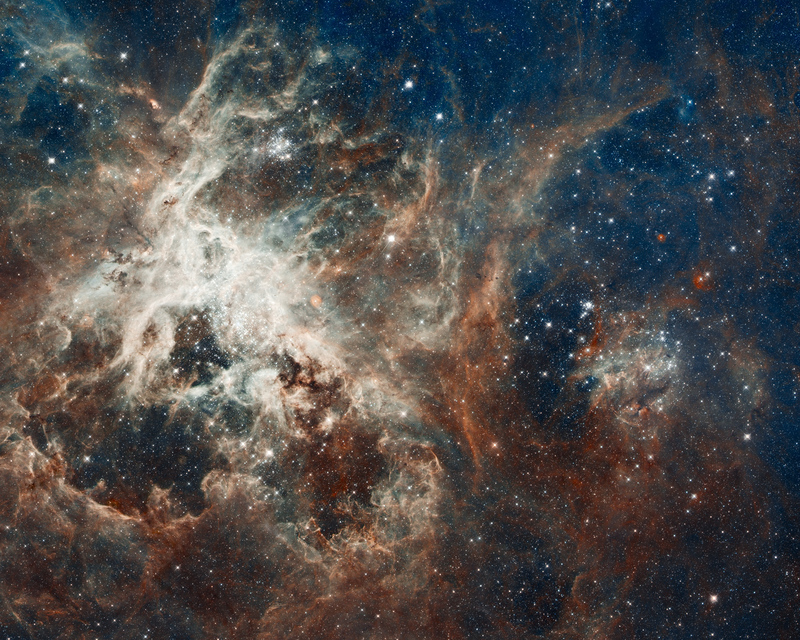 Millions of young stars shine brightly in this enormous stellar nursery at the heart of the Tarantula Nebula. The Hubble space telescope captured this amazing panorama, which reveals intricate details about the expanse known as 30 Doradus. Located about 170,000 light-years away in the Large Magellanic Cloud — a small galaxy orbiting our Milky Way — 30 Doradus is one of the largest and most prolific star-forming regions in our galactic neck of the woods. The region is so huge that, if it were as close to us as the Orion Nebula (the nearest stellar nursery to Earth, about 1,300 light-years away), it would be the size of 60 full moons in the sky and glow so brightly that it could cast shadows on the ground. What first becomes obvious in looking at the Galileo events is that the battle was not ‘science’ against an outside foe, Christian or otherwise, so much as old science against new science. It is a battle which has been repeated again and again throughout history. Newtonian physics seemed definite until Einstein came up with a new theory. Heat was explained as an accumulation of phlogiston until thermodynamics was developed. In retrospect, it is easy to pick the winners, but at the time such debates are usually very confusing. There are always more bad guesses than good ones, so how do you tell if the new theory is actually better than the old? Should scientists merely extract the good bits from the new theory and incorporate them into the old? Should the old be overthrown entirely in favor of the new? Such a competition was played out in the astronomy of the late sixteenth and early seventeenth centuries. The old theory was geocentrism, in which the Earth is at the centre of the universe with planets (including the sun and moon) and stars revolving around it. All physics, dynamics and matter theory back up the cosmology. The new theory was heliocentrism, with the sun at the centre of the universe and the Earth, one of the planets, revolving around it. We, of course, know which theory won. The heroes of the story for twentieth-century viewers have to be those who supported the heliocentric universe. At the beginning of the seventeenth century, however, the geocentric universe looked far more likely—and it was the scientists of the day who thought so. In 1543, in the last year of his life, a modest Polish astronomer named Nicholas Copernicus published a speculative astronomical theory. It was in a work entitled De revolutionibus orbium coelestium—“The revolution of the heavenly spheres.” It was different from the old Ptolemaic theory, in placing the sun rather than the Earth at the centre of the universe. It was like the old theory in that all the planets moved in circles around the centre. … Copernicus’ theory was ‘better’ from a scientific point of view, in the sense that it was slightly simpler and explained a few astronomical events more satisfactorily, but it was by no means overwhelmingly convincing. Why review this technical information? Simply to put the whole debate in context. We speak of ‘The Copernican Revolution’ as a crucial moment in Western history, when Copernicus discovered after centuries of error that in fact the Earth moves around the sun. Yet it was not quite like that. Copernicus’ theory was, from a purely scientific point of view, only marginally better. Of course he was right, but how could people know that at the time? Besides, he was not completely ‘right’—his commitment to circular motion meant that his theory necessarily had problems. This helps to explain the fairly luke-warm reaction to Copernican theory in the years following his publication. It was not due to church interference, or Christian dogma—the theory was a matter of technical astronomy, and only of real interest to fellow astronomers. On the whole, they were not much impressed. Of those who showed any interest, most merely made use of Copernicus’ improved calculating techniques but ignored or rejected the theory as a new way of understanding the universe. For instance, in England the first clear exposition of Copernican theory was not until 1576, in the only work that century which explicitly endorsed the theory. Even those astronomers who were mildly in favour of Copernicanism were inclined to regard it as an adaptation of the Ptolemaic system, and used a semi-Copernican theory in which the Earth rotated in the centre of the universe. By 1600 only ten astronomers can be identified who thought Copernicus was right. In other words, Copernican theory was not the great overnight revolution. It was a relatively unsuccessful addition to astronomical knowledge, which the majority of professional astronomers failed to take up. The church decision to reject it in 1616, though in hindsight wrong and made for the wrong reasons, was not at the time so very irrational. Galileo was not defending the forward march of scientific free thought against reactionary dogmatism; he defended a speculative theory with little corroborating evidence, in opposition to the majority of scholars of the day. I don’t know about you, but, never having studied this before, I had no idea how controversial, scientifically, the idea of the sun sitting at the center of the solar-system, rather than the earth, was. The first sentence in this passage really sheds light on what was going on: “…the battle was not ‘science’ against an outside foe, Christian or otherwise, so much as old science against new science.” This, for me, has the effect of reminding me that our current scientific knowledge does not belong in the privileged category of “what we know” but in the more dynamic category of “what we think, for now, based on things we see and our best interpretations of them.” In other words, it helps to remember that the history of science is one of process and changing beliefs as new discoveries are made. In the next post we’ll look at the system of thought that made it so hard for people to accept the new evidence Galileo brought forward. Here’s a teaser: it had nothing to do with the bible. For decades historians of science and early modern Europe have recognized this glib picture [of the church persecuting Galileo for his science] as a caricature—yet the caricature refuses to die, held up by those whose propaganda it suits. The ‘Galileo incident’ as it has come to be known in the literature, can be described as any number of things, but to see it as an example of church dogmatism versus free thought rather misses the point. It was a political battle between warring academics and academic traditions, fought over the issues of disciplinary boundaries and academic prestige; it was a clash between medieval and modern conceptions of knowledge; it was a matter of power politics. It was a time when the educational structure was changing and old-school academics fought hard to maintain their traditional privileges; and when the individual state was taking over from medieval structures and political battles were fought over intellectual rights. Put this against the background of Reformation and counter-Reformation, after the Catholic church had been shaken to the roots by Protestant demands for the individual’s right to personal access to the Bible, and it is not surprising that somewhere along the line, someone was charged with heresy. The fact that it was the Copernican system that precipitated the trial is (for the Catholic church at least) historically unfortunate. Crises could have occurred over a range of other issues, given different circumstances; and had Galileo been a less abrasive character, had his involvement in academic politics been less prominent, had the political situation been different, it might not have happened at all. Galileo’s career does not demonstrate an instance of Christianity versus science. It does demonstrate what happens when old science is challenged by a new theory—many of those in the scientific establishment react with skepticism and dismiss the new challenger. Galileo’s story is really about Aristotelianism versus modern science. Galileo fought for a new science, against the entrenched conservatism of an intellectual system which had been accepted for centuries (Aristotelian philosophy) and against individuals in the universities who were not at all willing to have their jobs and their professional reputations challenged. The main lessons we learn from Galileo are about how science changes. Apart from that, Galileo’s career demonstrates how dangerous politics can be—for once Galileo became embroiled in the political scene of the seventeenth-century papal court, he was in a very risky position. Here is another great reminder about the need to remember how complicated real life can be. When someone frames Galileo’s life and discoveries as being about “fact” or “science” as opposed to “faith,” they’re not doing justice to the actual life and work of Galileo. It’s just not what happened. Similarly, if we frame the current discussions of Christian doctrine in light of the findings of science in the same, simplistic way, we don’t do justice to the actual nature of reality, especially the academic and scholarly realities, of all the various reasons why someone may or may not hold to or promote certain views. This is not said in order to discredit anyone or do an end-run around scientific findings. It is only that we have the need, in our day, to recognize the complicated nature of these discussions. As Christians, we can keep our intellectual footing more easily if we remember that unbelieving scientists are not, as a general rule, on a simple and dispassionate search for truth. There are always larger things afoot, and quite often, they have nothing to do with science at all. In 1616, a board of theologians for the Roman church discussed the new Copernican theory. The result of that deliberation was an official decree stating that to say the sun is at the centre of the world and immovable is ‘foolish and absurd’ and ‘formally heretical’; and to say that the Earth moves is similarly foolish and ‘erroneous in the faith’. Sixteen years later Galileo Galilei faced the Inquisition on charges of heresy because of his belief in that same theory. He was ordered to abjure his heretical opinions—that is, to state that he firmly believed that the Earth did not move—and was sentenced to a prison term with penance. Galileo, the symbol of free thought and the power of science, was brutally crushed by the blind stupidity which is the inevitable consequence of an institution based on revelation rather than discovery. It was a classic and poignant example of the irreconcilable clash between the two worlds. Galileo, threatened with torture and the might of the Catholic church, recanted and stated through clenched teeth that he did not believe that which he knew to be true. Yet the spirit of free thought could not be suppressed. As he left the room with its instruments of torture, he muttered, ‘…and yet it turns’. It is a picture that suits propagandists of many types, but unfortunately it lacks a certain element—it’s not true. We need to be careful about ascribing past crimes to Christians, especially when we’re thinking through similar issues today. This is not to say that Christians haven’t done things wrong. It is just that we shouldn’t assume that the history people throw around is always correct, especially when they’re using it to criticize contemporary Christianity. We should be sure of what the actual history is before we make decisions today based on supposed mistakes of Christians in the past. The relationship between science and faith is not as simple as “evidence vs. belief.” The story of Galileo is a perfect example of this. It is often cited as an example of how Christians close-mindedly cling to their Bibles, or their traditions, or their power, in the face of obvious and overwhelming evidence. (Think—the current “evolution vs. creation” debate.) Sometime’s it’s people who really just don’t want to be wrong about what’s true (like some of my friends), but the story’s also used by people who think the bible’s outdated and needs to be thrown out. Interestingly enough, Galileo’s conflict with the church is totally applicable to the current “Science and Faith” discussion, but not in the way it’s usually used.